Game Fish species in the lake include: walleye (pickerel, doré), northern pike, smallmouth bass, largemouth bass, yellow perch, brown bullhead, channel catfish, rock bass, and American eel. Calabogie lake is known for its walleyes for the Ontario Ministry of Natural Resources regularly stocks walleye fingerlings. However, smallmouth and largemouth bass are abundant. 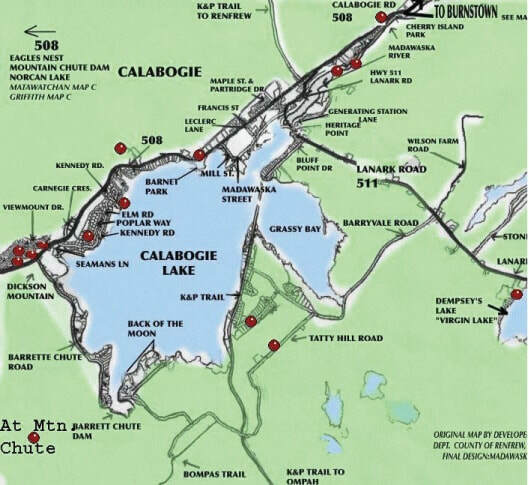 Burnstown Beach See Calabogie (AREA) Tourist Map for exact locations of boat launches. Maps are available at the Township Office, Munford's Take Out and Gas Bar, Calabogie Tourist Booth, Lacourse Mini Mart in Griffith, Neat Coffee Shop in Burnstown and at many other business locations in the township.